Is my favorite debut really a debut? As I read the “Best of” book lists, and reflect back on my year of reading, I concur with Michelle Obama that the best book I read, and reviewed, this year was Elizabeth Alexander’s The Light of the World. Her poetic use of language, emotional openness and roving intellect made this memoir stay with me weeks and months after I put it down. And as I wrote in my review, my husband got so engrossed with the story that he actually missed his subway stop on his commute home, ending up in a completely different part of Brooklyn than he was headed, when he finally looked up from this book. She tells the story of the untimely death of her husband at age 50, then goes back in time to share their love story and moves forward to explore her, and her children’s, grief. The book is a wonderful meditation on love and on loss. But although this book is her first memoir, Alexander is such an accomplished poet and academic, with eleven books of poetry and four books of essays published, that I wonder if she counts in the debut category? Since it was her first memoir, I took liberties to include her on my “debut” reading list, and after I loved the book so much, I wanted to share that with all of you. Etta and Otto and Russell and James, by Emma Hooper, for its magical tale and quirky story. The Unfortunates, by Sophie McManus, for its breathtakingly precise and beautiful language that made me feel like I was reading a book written 100 years ago. And Disgruntled, by Asali Solomon, for her ability to capture the teenage years of a unique girl growing up in Philadelphia. Although The Unfortunates was written up quite widely when it came out and was nominated for the Center for Fiction First Novel Prize, all of these books deserve more attention than they got. And the authors all capture unique female stories which deepen our collective understanding of the world. How about you? What debuts did you read this year that you really loved? In the new year, I will write about books that I didn’t get to yet in 2015, including The Fishermen by Chigozie Obioma and Angela Flournoy’s The Turner House. Happy holidays, dear readers….to a festive end of the year. Until 2016! Girl at War, by Sara Nović, a coming of age story set in Croatia during the Yugoslav Civil War, and New York in 2001, about a young woman coming to grips with her experiences during the war. The Turner House, by Angela Flournoy, a family drama set in Detroit in which the 13 children in the Turner Family need to decide what to do with the family house, which has lost its value in the financial collapse. 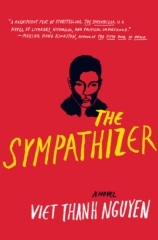 The Sympathizer begins during the fall of Saigon. The narrator, called The Captain, is a spy for the North Vietnamese, embedded in the South Vietnamese army. He is working for a Vietnamese General and flees Saigon with the General and a childhood friend, Bon. The opening pages are moving and memorable. Nguyen deftly captures the chaos in Saigon as the North Vietnamese invaded, and after some initial setbacks, the Captain, the General and Bon, and others, make it out and to Southern California. The Captain, who went to college in LA and speaks English well, gets a job working for a former professor and eventually meets up with a film director who, much like Francis Ford Coppola, is shooting a film about the Vietnam War. The Captain travels to the Philippines to work on the film, as a handler for the Vietnamese extras, all refugees living in the Philippines. This book is a spy story, a love story and a war story, but it is also a critique of the stories about the Vietnam War that have come before it. Told with a first person narrator, the book explores how Americans have appropriated the Vietnam War in books and films, and how our stories are about our experiences and for the most part render the Vietnamese experience to cliché characters whose screams we don’t even know how to accurately capture on film. Nguyen’s prose is intense and beautiful, reminding me of Roberto Bolano’s in 2666. The Sympathizer is a dense read, but an amusing and entertaining story, while also being political. The ending though took me by surprise. There are some scenes in the final pages that were rather gruesome, and are not for the faint at heart, but overall I found this to be an immensely satisfying book and one that made me rethink how I thought about the Vietnam War and what happened to the Vietnamese soldiers who fought on both sides after the war. I could see this being a good book for a book club, as I wished I had people to talk about it with when I was done reading it. Nguyen is a professor at the University of Southern California. He was born in Vietnam and grew up in the United States. A received an e-book version of this book from the publisher via Net Galley.